My dispenser does not seem to be charging properly. How can I fix this? If it seems like your dispenser is weak and is not charging properly, please remember that you might need to use an extra charger to reach the desired results. We recommend using one to two chargers and shaking vigorously before dispensing the product. Is this whipped cream dispenser dishwasher safe? Only the stainless steel components are dishwasher safe. All plastic and aluminum parts must be washed by hand, including aluminum bottles, plastic/aluminum heads, and anodized heads. What temperatures are safe to use in this whipped cream dispenser? 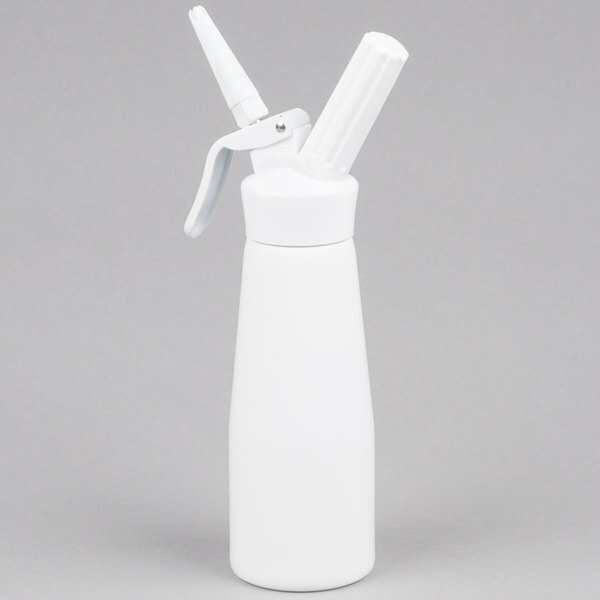 This whipped cream dispenser is designed for temperatures from 37 to 122 degrees Fahrenheit (3 to 50 degrees Celsius). It is best used for sauces, whipped cream, cold mousse, foam, or cold light desserts. 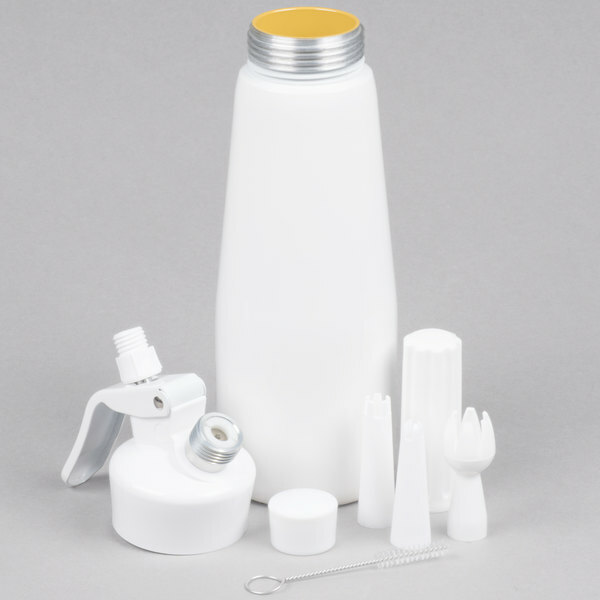 Whip up a sweet treat in your restaurant, bistro, or coffee shop with this .5 liter white whipped cream dispenser! 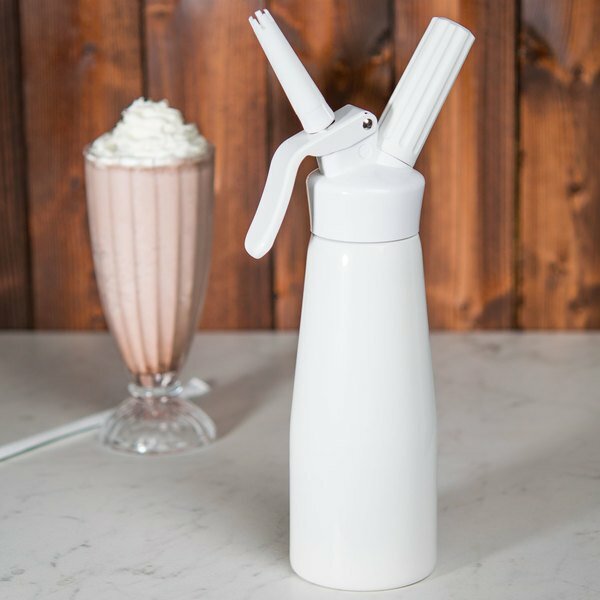 Whether you're topping off a classic ice cream sundae with freshly-made whipped cream or making a batch of your rich, chocolate moose, this whipped cream dispenser makes it easy to create custom desserts. It's even great for making unique toppings and sauces. Simply add ingredients, screw on the top, insert a decorating tip and a charger cartridge, shake the container, and dispense your cream, syrup, or other creative topping. Made of durable aluminum with a sleek, white finish, this dispenser is user-friendly and made to withstand daily use. It even comes with 1 plastic decorating tip so you can quickly begin topping off blended beverages, cakes, and pies with a dollop of your signature whipped cream. When you're finished, simply place the container in the dishwasher for easy clean up and hand wash the rest of the dispensing components. Note: A N2O cartridge is required for operation. Opened one of these dispensers. Had dispensers like these before without problems. Didn't work real well the first time I used it. Cream did not whip real well. When I went to refill it, it would not hold a charge. Checked the directions again to make sure I was doing everything okay. Tried it two more times, which means I used up three chargers. It leaks out the top of the dispensing area hinge. Took out another one of the new dispensers. Had the same problem with that one. Tried that one twice as well. Took out a third dispenser. Seemed to work okay, but the closer I get to using up the contents, the less it dispenses good whipped cream. I am following the directions and I am hesitant about trying to refill it again. Have others had this same problem with these dispensers? Thank you for your review! We are sorry you've been having issues with these dispensers. A Customer Solutions Representative will contact you soon to help resolve this issue. I've seen better. You get what you pay for. Ours didn't hold the pressure the entire time, so the whip came out like foam and it dissipated away. Spend a few more bucks and get the better brand. Thank you for the review! We are sorry to hear that this whipped cream dispenser was not your preference. 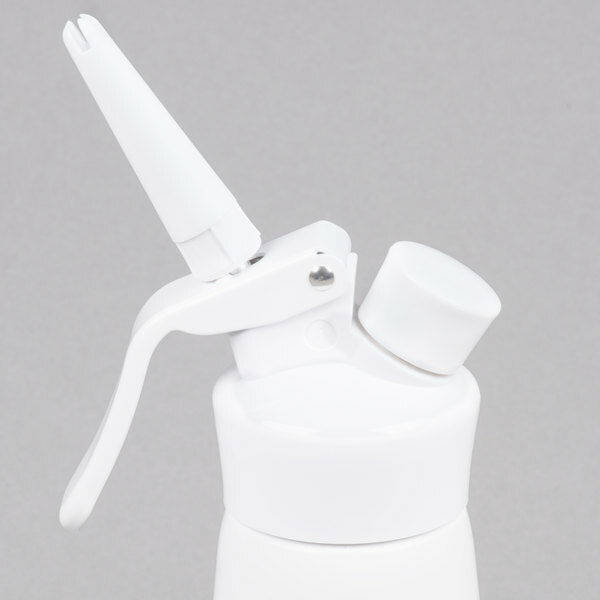 We recommend this Whip-It SV PRO-07 1/2 Liter Professional Cream Whipper instead. I would recommend the .5L over the 1L, as its much easier to handle. The .5L is still a nice size. You must purchase the n20 cartridges. You should read the directions carefully as they do require assembly. Also, do not fill to the top with cream (must leave some room for air). I love this whip cream dispenser. It's a great size to travel with. If you have an event somewhere else or even entertaining guess and want to seem fancy and have a whip cream dispenser this is the perfect one to have. I love it and I def. Use it to show off at my get togethers lol. I really loved my Whipped Cream Dispenser. I now use this dispenser on a weekly basis to make fresh Whipped Cream. Works great and easy to clean. Our old whip dispensers were failing, so for the low cost of this product we thought we would see how they measure up. So far they’re performing perfectly, and the clean white container is very appealing. Highly recommend! These whip cream dispensers are easy to use and keep clean. They're the perfect size for our cafe and a great value for the money. this great not only for whipped cream, but also to make sponge cakes. you just need to know how to close properly. and this is the best price. We use this dispenser to make fresh whipped cream on a daily basis for our Milkshakes. Works great, easy to clean (we tear them apart fully). Fits into our underbar cooler well. We use them daily and they have worked and held up well. We love our whipped cream dispenser! We use it to make coconut whipped cream at our vegan coffee shop. The white color is nice too. Great if you want to make them custom! Cut out vinyl and put my company logo the staff thought i had it custom made, no just got this and a $2 vinyl sheet. This is the first time I've ever used one of these things and I made a huge mess. I used up 3 cartridges just trying to figure it out despite reading and following the directions. The first go round I hadn't read the directions and installed the cartridge before screwing the lid to the canister... Stupid I know. The second time the cream was liquidy and sprayed out like the jet setting on a shower head. After vigorously shaking it the whipped cream was as it should be. The third time a co-worker had complained that it didn't work and again was liquidy so I made the mistake of opening the canister and cream exploded all over the place. I gave it 4 stars despite everything because I definitely feel it was operator error. I put a mix of cream, vanilla, and powdered sugar in it and it worked fine and was tasty. I just made sure to whisk out the lumps in the sugar. Great for flavored whipped cream! Stays cold, stands out against the normal stainless steel so I can easily identify it as flavored. Comes with several tips. Easy to clean. 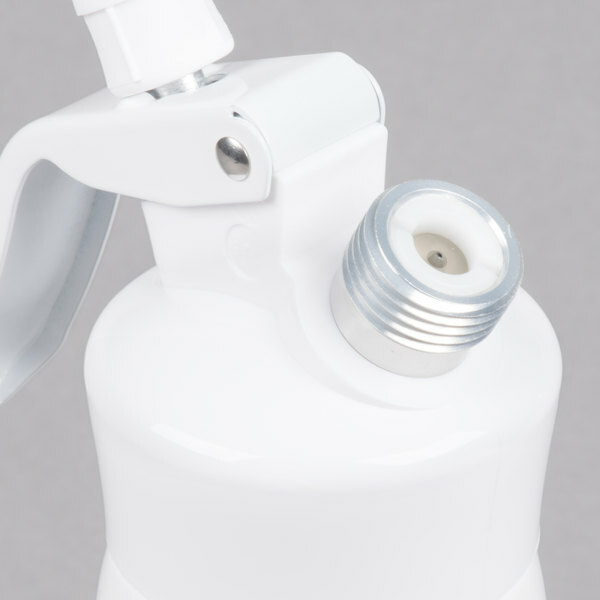 This whipped cream dispenser is easy to use and clean. As well as the smaller size makes it fit perfectly in our fridge when not in use. love it once you get the nag of how to use [email protected]! we top smootheis and lattes withj whipped cream with ease now and it still is our homemade, no Ready Whip here!! works as it should, sturdier than I thought it would be for the price which is a major plus. So much better to make your own then buy store bought stuff! This is a great product. It's so much tastier to have real whipped cream on a dessert or in a drink. This makes it very easy to use the cream. 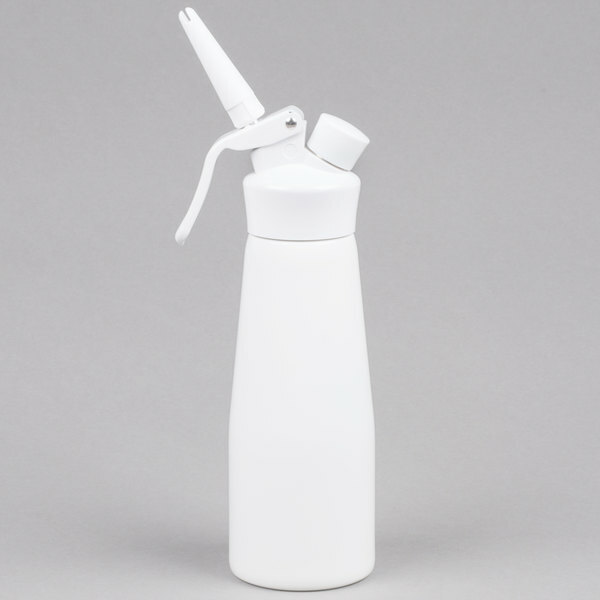 This half liter white whip cream dispenser is a very economical product to have. Perfect for making your own whipped cream for dessert sure coffee or hot chocolate. this would be my 3rd purchase of this whipped cream dispenser. i love how compact it is and so easy to store away once i'm done using it. love it.